Row by Row Experience is for avid quilters and sewers who love to travel and love to add the next new quilt to their collection. Since 2011, Row by Row Experience has engaged tens of thousands of quilters all over the world with the fun of collecting free row patterns while visiting local quilt shops, then creating themed quilt projects using the rows they collect. This year's theme is Sew Musical. Row patterns will be available to pick up in person at shops beginning June 2. 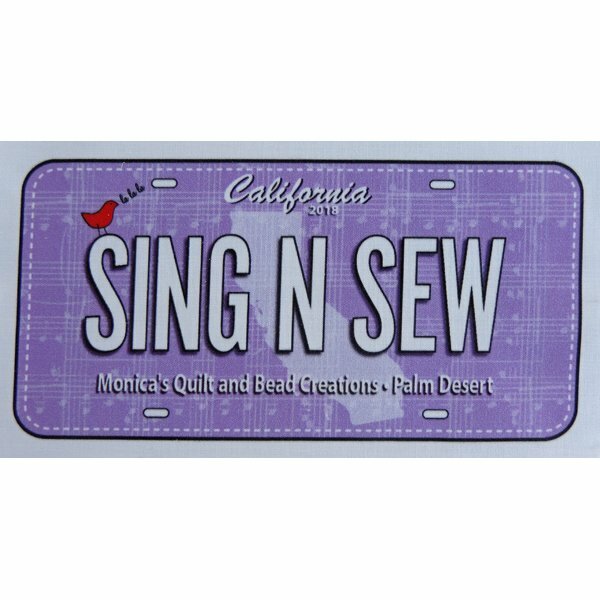 Sing N Sew is one of two fabric license plates we created. Add these novelty printed panels to any project, tote or quilt. They are 100% cotton and washable in the gentle cycle. Size: approx. 7 1/4" x 3 1/2"